1. Plan your meals: Plan your meals for an entire day so you dont find yourself at a fast food drive through because you ran out of time to cook a nutritious meal. 2. Start your day with a Healthy Breakfast. 3. Eat small balanced meals more frequently. A healthy diet is the result of receiving nutrients from a variety of foods. Too many times, people consume the same food items in their daily choices which does not offer them complete nutrition. These items may be healthy and full of a particular nutrient, however, optimizing uptake of all essential nutrients, vitamins and minerals entails combining foods to receive the maximum benefit each one offers. In essence, this is the very definition of the food guide pyramid. It establishes daily eating patterns by illustrating the significance of balance among different groups of food. 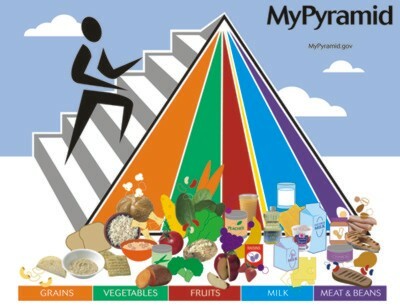 The pyramid breaks down food into five different groups and offers recommendations of how many servings of each group should be consumed a day. According to the United States Department of Agriculture (USDA), the base of the pyramid should serve as the foundation of the diet with regards to servings. As you progress to the top towards the tip, recommended servings decrease. The USDA recommends carbohydrates, by way of the bread, cereal, rice and pasta, serve as the foundation of your diet. Specifically, six to 11 servings per day should come from this group. The range of servings is based on individual caloric intake needs from 1600 kilocalorie (kcal) to 2800 kcal per day diet. A serving size from this group could include one slice of bread, 1 oz. of ready to eat cereal, or 1/2 cup of cooked cereal, rice or pasta. The vegetable group represents the next step on the pyramid with recommended servings of three to five per day for a healthy diet. One cup of raw leafy vegetables, 3/4 cup of vegetable juice, or 1/2 cup of cooked or raw veggies constitute one serving. Some veggies, like dry beans, peas and lentils can be considered in the veggie group or can be counted as part of the meat and bean group. These natural foods can be great sources of Antioxidants , whose benefits include strengthening your immune system, slowing down the aging process and most importantly fighting off free radicals. Originally, when the food guide pyramid was constructed, fruits and vegetables were counted together as one group. More recently, they have been split into their own groups. Due to the sugar content found in most fruits, they were separated from veggies and reduced from three to five servings to two to three per day. A serving of fruit could entail one medium apple, banana, or orange, 1/2 cup of chopped, cooked or canned fruit, or 3/4 cup of fruit juice. Some fruits and especially berries have been called Superfoods a term used to describe plant sources (i.e. fruits, vegetables) that have a lot of nutrients and antioxidants. A tasty, simple, and efficient way to get more fruits, vegetables, natural health supplements, and herbs into your healthy diet is through all natural juices and Healthy Smoothies. Follow the link for recipes and information. Two to three servings per day is recommended for both the milk group and the meat group. These groups are closely related in that they both are good sources of protein. However, they both offer different essential nutrient benefits. Examples of a serving of milk include 1 cup of milk or yogurt, 1 1/2 oz of natural cheese or 2 oz. of processed cheese. The meat and beans group includes poultry, fish, dry beans, eggs and nuts. Single servings are 2 to 3 oz. of lean meat (cooked), poultry, or fish. One egg counts as 1 oz. of lean meat. Two tablespoons of peanut butter or 1/3 cup of nuts would be considered 1 oz of meat, as well. It is the smallest part of the pyramid, the tip, that is responsible for a large bulk of the problems Americans face in their diets. Fats, oils and sweets make up the tip of the pyramid. No set daily serving recommendation has been established for this group. Instead, individuals are cautioned to "use sparingly." Foods in this group are high in fat and sugar and provide little, if any, nutritional value. Although this area represents the tip of the food pyramid, it is not included or considered as one of the five food groups. On the other hand if you fancy healthy desserts, check out these Healthy Dessert Recipes. Click on the Healthy Recipes link for nutritional healthy cooking ideas and healthy recipe links. Health Foods & Gym Products : Offering a large selection of health foods, health products, supplements, gym products and recreation equipment ; and ample information about health and their benefits on the human body. Whether you're actively training or a weekend warrior this food science company provides the best nutrition for everyone. At Hot Cougar Women you will discover ways to have an active and healthy life. Relationships,dating, beauty and fitness are a few of the topics that you will find on this site. Life as a Cougar woman is a wonderful way to live your life. Click here to return from the nutrition page to the Fitness and Health Home Page.